Heerlijke vakantie gehad bij Lorenzo, Catharina en hun dieren. Iedereen absoluut aan te raden! Zeer ontspannen verblijf ervaren op Madonna degli Angeli. Eigenaren Lorenzo en Catharina zijn erg vriendelijk, zorgzaam en oprecht betrokken bij hun gasten. Het park is goed onderhouden, erg groen en mooi! Het appartement (La Pergola) waar wij in zaten had alles wat we nodig hadden, was leuk ingericht en was erg schoon. Alles was van goede kwaliteit en dat alles met behoud van de authenticiteit van de regio en de familie van de eigenaren. Lorenzo en Catharina weten veel over de regio en doen ook hun uiterste best om dit over te brengen op hun gasten (als de gasten daar geinteresseerd in zijn, anders laten zij je helemaal je eigen ding doen). Al met al, zou ik het verblijf bij Madonna degli Angeli sterk aanraden aan mensen die graag wat van de regio Abruzzo willen zien of die gewoon lekker tot rust willen komen aan het zwembad. Het restaurantje Marlon (5 min lopen vanaf de boerderij) is trouwens een leuke aanrader als je makkelijk en voor niet al te duur, goed wil eten. Ciao, thanks a lot. It has been very nice to guest you ! You are a wonderful family. People like you makes this work great ! A friend and I stayed in one of the farm’s larger suites and absolutely loved our time here. Even at the beginning of November the weather was dry and sunny, and our lodging was comfortably warm. We were two middle-aged ladies who felt really cared for by our host Lorenzo and his manager Marino. Abruzzo is off the well-worn tourist path and is one of my favorite places to visit in Italy. The breathtaking mountains dusted with villages clinging to their sides, some of the best fresh food in Italy and surprisingly delicious dining in hidden restaurants everywhere. You won’t find a lot of English speakers here unlike in the cities. But you will find friendly, helpful people who are not resentful of a constant parade of tourists as in some Italian cities. If you are like us, you will also find yourself often lost, scratching your head over the closed gate of a medieval church you have just driven 15k to reach, and squeezing your oversized car through ancient alleys on vertigous mountainsides until you can go no farther. Then there are the ski to sea opportunities, but I will let others talk of that. We happened to be at the farm during the olive harvest. I’m sure whatever time of year you visit, you’ll find a piece of authentic Italy here. I would definitely return for a stay at Madonna degli Angeli. Thank you Lorenzo and Marino for such a wonderful visit. also for us it has been very nice to meet you. We are very happy you enjoyed our agriturismo and our beloved land, the Abruzzo. We wish we met you once more, there are so many more things to visit and discover in this "authentic" part of Italy, where the nature, the history and its traditions have been proudly preserved through the history. Alles gemäß Beschreibung, so soll es sein. Danke. Wir waren zu zweit für 11 Nächte in "la pergola" untergebracht. Alles war so wie auf den Bildern zu sehen und wie im Text beschrieben. Es war sauber und alles funktionierte einwandfrei. Zwei Kleinigkeiten nur: 1. Es ist nicht wirklich ein Bauernhof. Ein Esel, zwei Ziegen und eine Hand voll Hühner sind zwar auf dem Gelände, aber Landwirtschaft wird nicht betrieben. 2. Teilweise war lediglich eine Aushilfe ohne fremdsprachliche Kenntnisse anwesend, allerdings war immer eine Kontaktaufnahme zum Eigentümer per Telefon bzw. WhatsApp möglich. Für uns aber beides kein Problem (nur zur Info, falls das jemand erwartet). Daher volle 5 Sterne. Thanks Daniel for your very positive feedback ! I am happy you enjoyed and gave me the maximum of stars ! I personally welcomed you (I speak English and also a bit of French) and came to the farm every 1/2 days. Often when I came I didn't met you because you had very intensive days visiting the territory and when I leaved the farm to go back home (around 8 or 9 P.M.) you often had not come back from your tours ! I was happy for this as this has a positive meaning ! Anyway most of the time I met you I proposed to better discuss about possible further tours in Abruzzo, but you said that you already knew were to go as you came to Abruzzo several times ! All the other days there where some workers and friends of mine, indeed not speaking languages, but as you wrote I was always available and reachable by phone, mails or WhatsApp when not present at the farm. Indeed welcoming guests and giving them advices on the territory (besides a lot of guides in all languages, in German too) is one of my best point. It has been a pleasure to meet you and your wife and I wait for you back here in Abruzzo soonest. If it will happen I will maybe insist some more to sit together and speak a bit more about possibilities of trekking, sometime maybe I am too shy. This is a lovely rural place to stay, close to nature. The buildings and the surrounding grounds are very attractive and peaceful. The setting is beautiful, with wonderful views to the nearby mountains. 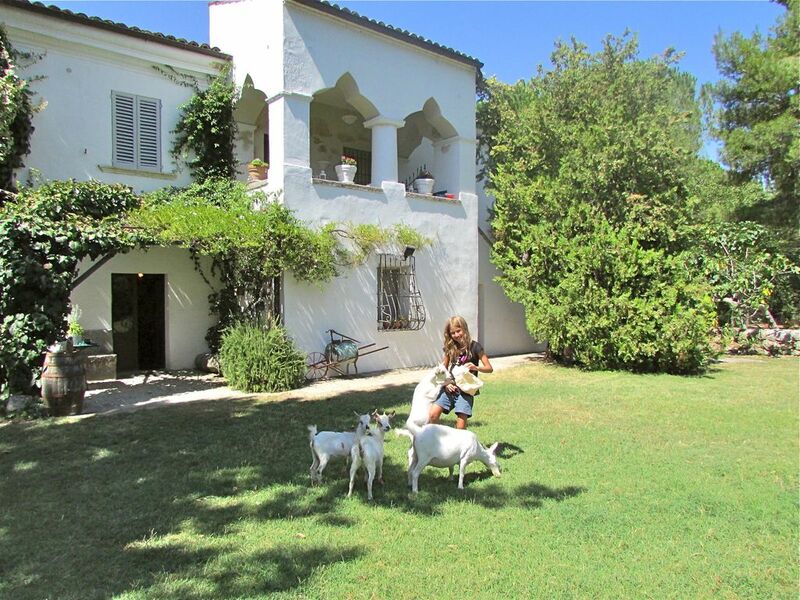 The very pleasant and relaxed feel to the place is enhanced by the chickens and goats wandering around, the cats, the donkey, and the ever present, lovely and very friendly golden retriever Lola. The owner Lorenzo is delightful. He is very friendly, welcoming and helpful and an excellent source of information about Abruzzo and what it has to offer. The location is superb, being near to so many places and sites of great interest and also the wonderful mountains and beautiful Adriatic sea. Our appartment was clean, comfortable and serviceable, with some nice touches in some of the old furniture and wall hangings. For self catering, the kitchen and catering equipment was adequate and there was the nice touch of the provision for one's arrival of a few basic items. Without detracting from that, the equipment was lacking a few things that would have helped and improved for cooking and self catering. In summary, this is a wonderful place to have found and if we return to Abruzzo, we would have no hesitation in trying to book to stay again at this charming agriturismo. Location and property were absolutely according the description. We loved it. Everything was fine. Lorenzo, his family and the staff were very friendly and eager to help. If you come here don't forget to buy the olive oil from the agriturismo. It's realy great. We loved "our farm" and our apartment. The description said small but we had a large bedroom, living area and terrace. We ate eggs laidby our chickens and Lorenzo was our personal travel guide. We did four days of gorgeos hiking. Iy doesn't get any better than this.